The Google Webmaster Central Blog announced that they have expanded the error reporting to include less serious errors, which are now called "warnings." 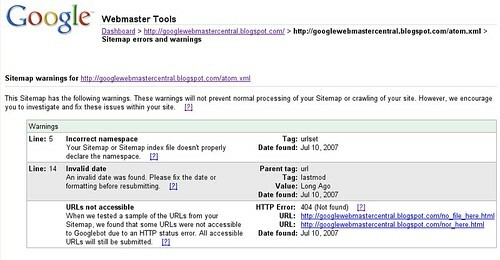 If Google finds "minor problems in a sitemap," they will call it a "warning." If Google finds a more serious problems, they call those "errors." A warning is something that may contain "confusing or inaccurate" information in your sitemap. But an "error" may be an issue that makes your "sitemap completely unreadable." The new set of warnings includes many problems that we had previously classified as errors, including the "incorrect namespace" and "invalid date" examples shown in the screenshot above. We also crawl a sample of the URLs listed in your sitemap and report warnings if the Googlebot runs into any trouble with them. X-Google Webmaster Central guru, Vanessa Fox, wrote some more details on this at Sphinn and we have additional forum discussion at WebmasterWorld and Search Engine Watch Forums.